Among all the types of dishes I collect recipes for – the latest, greatest twists on comfort-food favorites, exotic creations from far-flung places I’ll probably never even muster the courage to attempt, things that look quick and nutritious enough for weeknight dinners – one category is probably the bizarrest. I collect dozens of recipes for things I don’t even really like that much. For example, I bookmark nearly every bread pudding recipe I come across, despite the fact that the most complimentary thing I’ve ever been able to say about one is that its texture reminded me of wet Kleenex. Ditto for rice pudding, only I think my precise words here involved something about wallpaper paste. And oh, don’t even get me started on fruitcakes – deep down I must know that putting dried fruit and cake together is the culinary equivalent of, say, double-booking a banquet hall for both the NRA and PETA, but that hasn’t stopped me from filling an entire folder on my computer with recipes for it, many of them promising to be the fruitcake even fruitcake-haters love. The thing is, I don’t even identify myself as a fruitcake-hater, or a hater of anything else for that matter; I prefer to think of myself as an aficionado-in-waiting, someone who will love it unconditionally just as soon as the right version presents itself. I mean, the millions of people who do can’t all be wrong, can they? Somewhere out there I’m convinced there’s a recipe with my name on it, and all I need to do to find it is keep trying. It doesn’t happen very often, but every once in a while this strategy pays off. Like last week, for example, when I finally fell head-over-heels for gingerbread (or in this case, ginger cake, though the difference, as long as we’re not talking about gingerbread cookies, is strictly a matter of terminology). I have been collecting recipes for this most quintessential of cold-weather desserts since I was thirteen years old and pulled one out of my oven that was so heavy, dry and completely dominated by the acrid taste of molasses that it went straight into the trash. I made a few more over the years that fared marginally better, but I think it’s safe to say that I never once met one that I had any desire to meet again. My collection of recipes for them has kept growing, however, including a recent contender from our very own David Lebovitz that he claims is his most-requested recipe ever, and whether you think you like ginger cake or not, that’s the kind of statement that makes you sit up and pay attention. As it turned out, it took me the better part of a year to put his claim to the test, but last week, battling one the nastiest colds I’ve had in ages, and looking for a bit of distraction from all my nose-blowing, I decided to give it a try. Funnily enough, at some point between putting the cake in the oven and pulling it out both my sense of taste and smell vanished without a trace (this often happens to me during colds, but never from one minute to the next like that!) and for two whole days all I could do was stare miserably at the cake while Manuel helped himself to piece after piece. So strong was his enthusiasm for the cake, in fact, that I had to start thinking about hiding places for the last few pieces, but luckily my airways unclogged before I had to resort to any truly drastic measures. And what did I think of the cake, when I was finally able to taste it? Well I know it sounds clichéd, but this is the very cake fall was made for. It was a cake that propelled me (leaky sinuses and all) out of the house on a late October afternoon, hands buried deep in my pockets and scarf wrapped tight against the arctic northern wind, the frigid air condensing my every wheeze and cough into wispy little breath-clouds, the weak sun doing nothing to stop my nose and earlobes and toes from turning into icicles as I trudged aimlessly through piles of brown and yellow leaves just so I could have the pleasure of coming home to a slice of it, tender and moist and so warmly spiced it seemed to thaw me from the inside out. In fact, as I settled back into my toasty apartment, a steaming mug of milky tea clutched between my frozen fingers and a softly slumped roasted pear nestling up against it on the plate, I would have been hard-pressed to say I’d ever eaten anything better. So I’ve obviously made my peace with gingerbread, but it does make me wonder if my other long-term food foes are going to be quite as easy to conquer. Certainly if you, dear readers, happen to have any favorite recipes for, say, bread or rice pudding, or even a fruitcake that you can’t imagine life without, I hope you’ll share. Buoyed by such success, my other aficionados-in-waiting are getting restless. Surprisingly for someone as tinker-happy as me, the only thing I felt the need to change in this cake was the amount of molasses. Since the recipe called for mild molasses and the black treacle I was using tasted anything but mild, I decreased the amount by one-third and made up the difference with golden syrup. I thought the flavor was perfect, so if you have any doubts about the strength of yours you might want to the same. 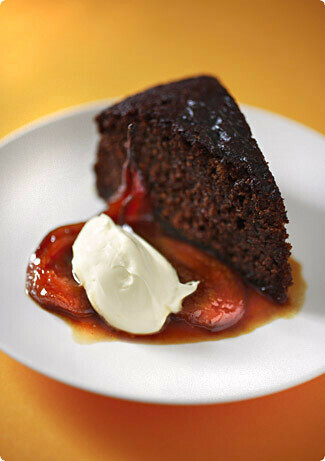 As for what to eat with this rich, spicy cake, I have to admit it’s pretty spectacular plain, with nothing but a cup of tea or coffee to help it go down, but garnished with a dollop of tangy yogurt cream and a sweet-salty caramelized pear, it verges on dangerously good. As in, I-may-never-make- another-dessert-again good. Or almost-worth-losing-my-taste-for-two-entire-days good! Position the oven rack in the center of the oven. Preheat the oven to 350°F/175°C. Line a 9-inch (23cm) springform pan (or a 9×3-inch cake pan) with a circle of parchment paper. Slice and chop the ginger very fine with a knife (or process in a food processor until very finely chopped). In a large bowl mix together with the molasses, sugar, oil and ginger. In another bowl, sift together the flour, cinnamon, cloves and black pepper. for about 1 hour, until the top of the cake springs back lightly when pressed or a toothpick inserted into the center comes out clean. If the top of the cake browns too quickly before the cake is done, drape a piece of foil over it and continue baking. Cool the cake for at least 30 minutes. Run a knife around the edge of the cake to loosen it from the pan. Remove the cake from the pan and peel off the parchment paper. If you’re making the pears, increase the oven temperature to 375°F/190°C. Nestle the pear halves in a baking dish just big enough to fit them in a single layer. Bring the remaining ingredients to a boil in a saucepan, stirring to distribute. Pour this mixture over the pears and roast in the oven, basting them with the liquid every ten minutes or so, for about 25-30 minutes, or until the liquid is bubbling very thickly and the pears are tender when pierced with a knife. (Don’t forget to remove the vanilla bean, rinse it lightly and add it to your extract jar, if you’re making some!) Let cool slightly before serving. Ohh, Melissa, that sounds so good. Gingerbread has always been one of my favorites–I used to request it as a birthday cake when I was a kid! So I’ll definitely have to try this sometime soon.That David–I’ve also been planning on trying the roasted banana ice cream you posted about a while ago. My husband hates any gingerbread I make. I will try this on him and see if it has the same effect on him as on you! I´m a terrible person, and very ready to beleive that millions of people can be very wrong indeed. But like you, I bookmark gingerbread recipes all over the place, thinking that sometime I´ll like one. So you´ve convinced me to start here. Well, I’ve bookmarked recipes for ingredients I don’t like, but haven’t yet tried them. You’re a much better foodblogger, Melissa :)Ginger Cake I’d try happily. And I love gingerbread cookies – or pepper cookies (piparkoogid) as we call them here – and cannot imagine Christmas without making them..I’m really tempted to try this recipe – I’ve never made ginger cake with fresh ginger before..
Sold! Though I must admit that I’ve never had a problem with ginger bread. As for bread pudding, I agree–most specimens are rubbery and leaden, more suited for the hand-ball court than your mouth. But there is an exception: a restaurant here serves a phenomenal chocolate bread pudding–it’s creamy, light and studded with rich dark chocolate. As you tuck into a bowl, before you know it you’ve polished off the whole thing, all the while ignoring the pleas of your friends for just one bite. "Get your own!" you’ll say with your mouth full. Though it’s wrong not to share something so good, so I’ll just have to figure out how they make it so there’s enough for everyone. I’ll admit that I’ve always been a fan of gingerbread – being a child who didn’t like chocolate drove me to the further reaches of teh dessert galaxy. But ginger cake…oh, ginger cake. My personal favorite is a ginger cake with blueberries – the sweet tartness of the blueberries adds so much moistness and wonderful flavor…oh, I’m off to make one right now. But definitely some pears for the side. That gingerbread does look good, I am finally coming round to gingerbread after years of not really getting the appeal. I ate the most fantastic chocolate studded bread pudding in Creeler’s last weekend so if anything could turn you that would and for fruit cake I point you towards Nigel Slater’s recipe in his Kitchen Diaries. I am not a huge fruit cake fan but this is delicious. mmmmmmmmm (what more can i say?) 🙂 sumptuous! well, the brown layer on top for one…and the creaminess of the dish..lol…does that help? I love the idea of ginger and molassesThese look so delish and beautiful! Hi Melissa,Being Indian, I always associated ginger with savoury food and like you, never really liked it in sweet things (Note the past tense.). So the last thing I thought I’d try was something baked with ginger. Until I came across this Good Food recipe, that is. How could I pass up a recipe with a name like that? When I saw the photo and read the recipe, I could almost taste the cake. And when I baked it, it was just as I imagined – delicious! I’m still not sure about ginger in many things, but this cake is one of my favourites. I must try David’s next! I do the same thing- I even collect recipes for lamb and veal and such despite the fect that I rarely eat meat. I suppose I have a sense of dread that I will have to cook something unfamiliar for guests and I better start practicing now.I do, however, love ginger cake. This recipe looks almost identical to the one I use except mine has Guinness in place of water. Looks delicious. this sounds fantastic!!! and perfect for the bag of ginger that i have to use up!! I am one of those people who don’t like rice pudding, fruit cakes and ginger bread. I can’t imagine what kind of force could convert me. Having said that, I find that as I grow older, I have come round to appreciate some food that I once dislike. Like sweet potato and carrot…. This ginger cake looks great! This recipe sounds delicious and the picture is gorgeous. Wow. I haven’t spent Christmas with my folks for five years, something that is very unfortunate. But for as long as I can remember, my Mom has baked ginger bread looking very much like this one for Christmas. I have not a clue what’s in it, but I will have to ask her for the recipe. She has a lot of delicious secrets among her collection, and ought to pay more attention to them.Thanks for reminding me. Hi, I just came upon your blog yesterday and I love it. Saw this recipe and had to try it right away – have never been a big fan of gingerbread, but your description and the picture were so convincing, I had to try it right away. Made it exactly per your recipe – was delicious!! Just a bit too sweet for me personally, o/w the flavors are fantastic. Thanks. I’m a foodie blogaholic and have favourited yours, Melissa. Thanks for the Ginger cake. Am going to try it tonight. My family is so impressed by the sudden improvement of my culinary skills. This cake has led me to decide that all desserts should be spicy. Fabulous! I was a little concerned when I was pouring liquid into a pan and expecting it to become cake, but oh did it ever. So lovely and dark and spicy and moist… ahhh. I just made this cake for my birthday and I followed your recipe adjustment because it was also what I had in the cupboard, and you said, it was perfect. I also added a bittersweet chocolate ganache icing flavoured with honey and Stone’s Ginger Wine drizzled over it which I think matched it perfectly and didn’t overwhelm it. It was a perfect, maybe the best cake I’ve ever had. I served it with spiced poached pears, dried apricots, figs and stem ginger and custard apple ice-cream. Thankyou for your post, it inspired me to select that cake to make for my birthday. Thanks also to David for a brilliant recipe.